Source: Brandon Green Spring is a good time to look at how “green” your home is. Below are 5 easy tips to “green” your home. I’ve learned so much by representing 4114 New Hampshire Ave NW (www.petworthgreenbuilding.com) and I’m thrilled to share. 1. Reduce energy – insulate your attic! 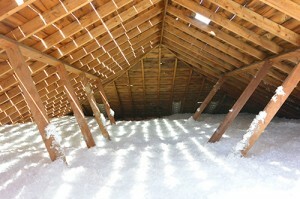 If you do nothing else, please be sure you have a significant amount of insulation in your attic. More heat (and cool in the summer) is lost through the attic than anywhere else in the house. Most homes I see in DC have no insulation in the attic whatsoever. You can either use a spray foam product like was used at 4114 New Hampshire, or even the traditional batting insulation. If you do it yourself it will only cost a couple hundred dollars and save you many hundreds over the course of a couple years.